YIELD: 90 BOARD FEET, 7.5 CUBIC FEET. Highest Density "Walkable" roofing foam, 3.4 Lb density. Two-component spray applied polyurethane foam. Chemically cured foam, reduces curing time significantly. FROTH-PAK dispenses, expands and becomes tack free in seconds. Patented anti-crossover nozzle eliminates chemical crossover. 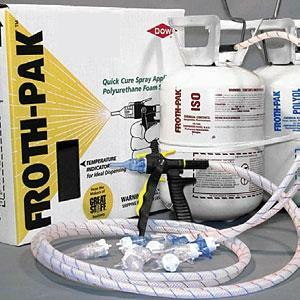 FROTH-PAK 115 kits are high density foam with initial R-value of 5.2. This foam is typically used for roof foam repair or new installation, insulating sealant to fill cavities, wall and floor penetrations, cold storage facilities and refrigerated trailers. FROTH-PAK 115 is also commonly used to repair spray-applied polyurethane roofs, test cut areas, damaged insulation boards or structure reinforcement.